June 2018 36 www.sportseventsmagazine.com delivering innovative standards and best practices for youth leagues and school- based programs to implement. USA Football utilizes the American Devel- opment Model (ADM), a U.S. Olympic Committee-crafted framework for skill development. The ADM promotes a player pathway for sustained physical activity and sport participation, and offers parents and kids multiple entry points and options to choose the best version of the game for each player. This adaptation of the ADM is a vision for long-term athlete devel- opment, allowing athletes to potentially progress through flag, Rookie Tackle and 11-player tackle, building a foundation for success as they enter high school football and beyond. A safety standard USA Football set in the sport on the youth level is Heads Up Football, which is a safer way to practice and play the sport as it includes programs specially tailored for youth football orga- nizations and scholastic football programs, which ensure that coaches have the right tools for the level of play they coach. "Heads Up Football ensures that every coach is trained in fundamental aspects of athlete safety, injury prevention and injury recognition, and the proper skill technique," said USA Football's Senior Director of Communications and Pub- lic Affairs Melinda Whitemarsh. "USA Football believes no coach should step on a field without being certified in areas of health, safety and the teaching of proper technique." Created and administered by USA Foot- ball, Heads Up Football establishes im- portant evidence-based practices through a comprehensive approach to teach and play the sport, and is supported by nearly five dozen organizations, including the American College of Sports Medicine, the American Medical Society for Sports Medicine and the National Athletic Trainers' Association. Since the incep- tion of the program in 2012, more than 600,000 coach certifications have been completed through the program, setting a new standard for how the game is taught and played. 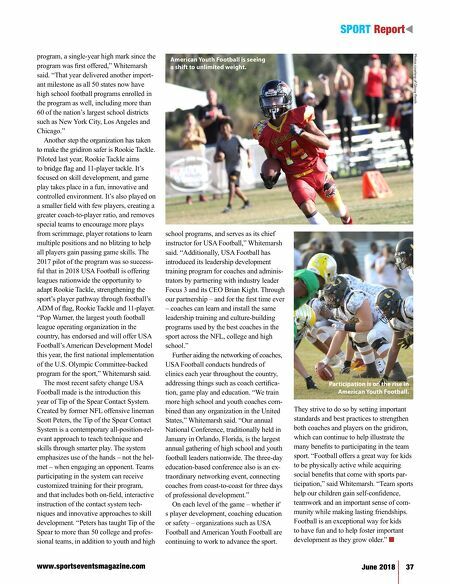 "In 2017, more than 10,000 youth and school-based programs enrolled in USA Football's Heads Up Football t SPORT Report Onfield action at a Rookie Tackle football game. Photos courtesy of USA Football The 2017 USA Football National Conference in Orlando, Fla.